Macaroons? Or Macarons? Whichever spelling you prefer (the single "o" is the French spelling), these are coveted as one of the most difficult cookies in the baking world. Temperamental and delicate, these little babies are not for the lighthearted kitchen goer. You've got to be committed for these...so I'm gonna break it down for ya! The recipe base I use is from Food Network Magazine. I like it because it gives fairly simple instruction, and the steps don't scare the crap out of first time Macaron-ers. I LOVE that these cookies are made from just a few ingredients. They're also gluten-free, and actually have a little protein from the egg whites! You can fill them with just about anything from jelly, to whipped topping to frosting. But, like I said, be committed, and be patient...verrrrryyy patient. In my Macarons today, I also used some strawberry baking emulsion. Emulsions are great, because they act just like extracts, but the flavors don't bake out of the emulsions like extracts sometimes do. But let's face it. Cookies are all about what's in the center, right? I mean, I've NEVER met anyone eat the outside of an Oreo and throw away the center. That's just wrong. So today, I used just a bit of cream cheese, a little powdered sugar, and LOTS of truwhip! I've always LOVED the light, airy and fluffy texture of store-bought whipped toppings, but I hated the JUNK that was in them. I just thought that was the only way for them to get that texture...through some kind of gross, scientific GMO experiment. 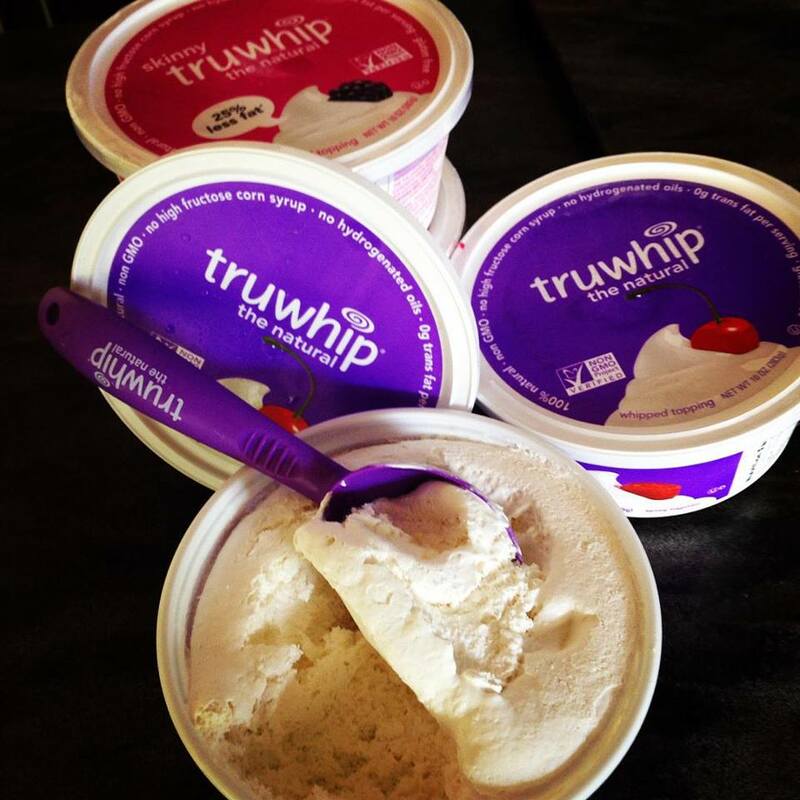 Not so... and truwhip is here to let everyone know that! Made mostly of tapioca syrup and palm kernel oil, this non-GMO product is free of high-fructose corn syrup, hydrogenated oils, trans fats AND gluten! SIGN.ME.UP. Make sure you visit their nutritional page for more info. I LOVE how they break down each ingredient with a little cloud and some helpful into as you hover over them. OH, and did I mention that they also have a SKINNY VERSION?! Yep. That just happened. Preheat the oven to 300 degrees using the convection setting. Line 3 baking sheets with silicone mats. (I flip the baking sheet over and place the silicone mat (or Silpat) on top. PLEASE use silicone mats, or Silpats. I know they're expensive, but they make a HUGE difference, and REALLY help keep the cookies in a perfectly round shape. NOTE: You CAN just use parchment paper, but don't expect perfect circles for your cookies). Measure the confectioners' sugar and almond flour by spooning them into measuring cups and leveling with a knife. Transfer to a bowl; whisk to combine. Sift the sugar-almond flour mixture, a little at a time, through a fine-mesh sieve into a large bowl, pressing with a rubber spatula to pass through as much as possible. It will take a while, and up to 2 tablespoons of coarse almond flour may be left; just toss it. (If you're a crazy perfectionist like me, you CAN run the almond flour through the food processor first, to make the grind even finer). Transfer the batter to a pastry bag fitted with a 1/4-inch round tip (or just the plain old ziploc I told you about earlier). Holding the bag vertically and close to the baking sheet, pipe 1 1/4-inch circles (24 per sheet). Firmly tap the baking sheets twice against the counter to release any air bubbles (drop it like its hot). Let the cookies sit at room temperature until the tops are no longer sticky to the touch, 15 minutes to 1 hour, depending on the humidity (if you live in Florida, it may take a week. I would just go to the store and buy some). Slip another baking sheet under the first batch (a double baking sheet protects the cookies from the heat) (I just flipped the baking sheet upside down. This prevented the Silpat from having a lifted edge and did the same thing they mentioned above). Combine all ingredients in a large mixing bowl and whip on low speed until sugar is incorporated. Increase to high speed and mix until creamy and combined. Spoon about 2 tsp. filling into the center of one of the cookies. Top with another cookie and serve!